I am normally the queen of delayed gratification. I can have a birthday present arrive in the mail weeks before my actual birthday and feel no overwhelming impulse to tear into the wrapping early. I wasn’t a child who went around shaking presents under the Christmas tree (at least, I don’t think I was). For me anticipation is genuinely half the pleasure. I love making restaurant reservations in advance and then perusing the menu online (at length and frequently multiple times) to build a sense of expectation for the enjoyment to come. That being said, this week’s Dinner involved a menu that I have been planning, contemplating, amending and fantasizing about for the better part of three weeks. This is not because it was a super duper crazy Birthday Dinner (that’s this Sunday – stay tuned for the overly ambitious Mad Hatter’s Tea Party Menu coming next week), but because it was a menu I was stymied on making time and again, and that is not the same as delayed gratification and I’m a lot less good at being stymied than I am at anticipation. By the time I got around to making it this week the recipes had achieved nearly mythic proportions in my mind, and I was going a little stir crazy waiting for Tuesday evening to roll around so that I could actually taste them. The first week I planned to make this meal a vegetarian unexpectedly ended up being able to attend Dinner, and I made soup and grilled cheese instead. Super tasty, but not the arugula pistachio pesto I had been thinking about either. The second week I planned to make it, I ended up having some medical tests on Thursday that meant I had weird eating restrictions for the first half of the week (relevantly for this menu – no carrots, no beets, and no potatoes with skins). We had chicken parmesan instead. Again, tasty, but not the lemony, vaguely Moroccan-y, chicken I was craving. 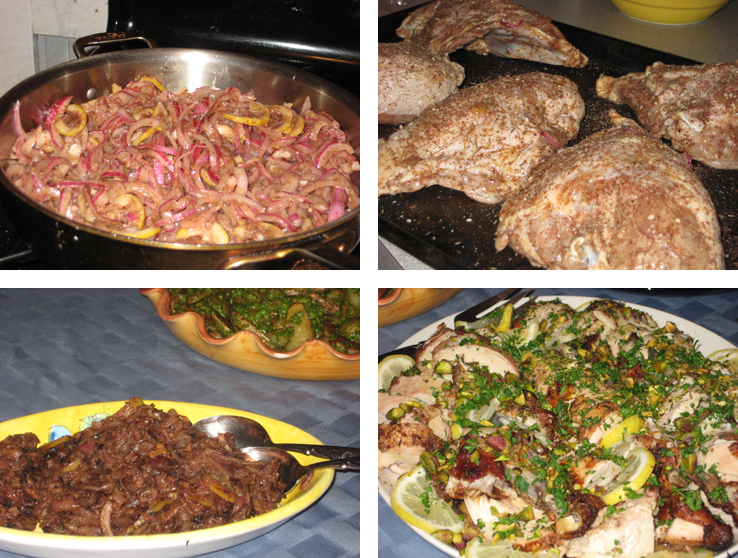 This week I was determined – come hell or high water – that I was going to make the roasted potatoes with arugula pistachio pesto and the sumac & za’atar roasted chicken, and further banish any thoughts of scurvy with roasted beet & orange salad, and lemon juice dressed carrot salad. I was well beyond a mere passing interest in the recipes, and inhabiting a space somewhere between yearning and grim determination. Fortunately after that much anticipation, both (new) recipes were as tasty as I’d been hoping, and the rest of the menu came together exactly the way I anticipated it would. I got up from the table on Tuesday evening feeling replete, and ready to return to my regular state of appreciation for delayed gratification. Mix chicken, onions, garlic, olive oil, spices, lemon, stock & salt/pepper. 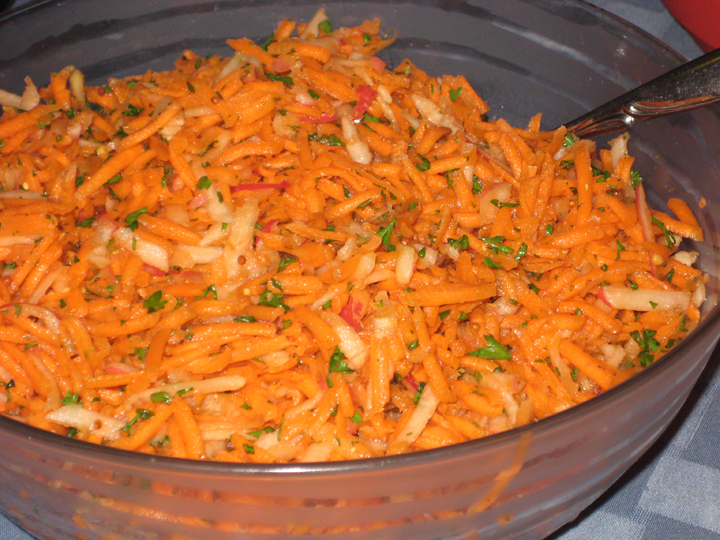 Leave in fridge to marinate a few hours or overnight. Heat oven to 400 F. Place chicken skin-side up on a baking sheet. Sprinkle with za’atar. Roast for 30-40 minutes, until chicken is cooked through. While the chicken is roasting place the marinade ingredients in a large pan and bring to a boil. Boil until most of liquid is cooked off, and then lower the heat to a medium high and continue to cook until the onion/lemon mixture turns into a marmalade (you may need to season with salt & a drizzle of honey). The onions are fairly wet from being in the marinade overnight and will need a higher than usual heat to make them caramelize – you’re looking for a deep dark brown color, and a sticky consistency. This will take the full time the chicken is cooking to achieve. Serve garnished with chopped parsley, pistachios & thin slices of lemon, and with the onion marmalade on the side (it may not look like much, but it tastes amazing). Combine 3 Tbsp olive oil, ¼ tsp salt, 1/8 tsp pepper, arugula leaves, Parmesan cheese, pistachios, water, lemon juice, and garlic in a food processor; process until smooth. Adjust seasoning to taste. Preheat oven to 400°. Place a sheet pan in the oven and allow to preheat as the oven comes up to temperature. Combine potatoes, remaining 1 Tbsp oil, remaining ½ tsp salt and ¼ tsp pepper in a medium bowl; toss well. 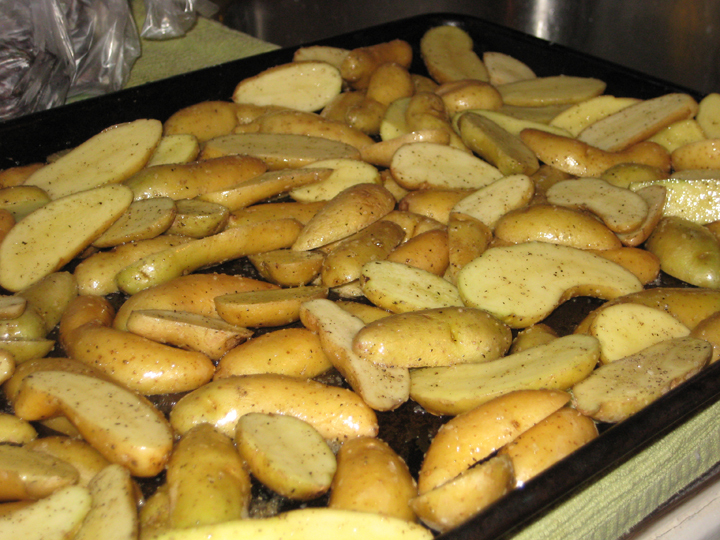 Arrange potatoes in a single layer on preheated pan. 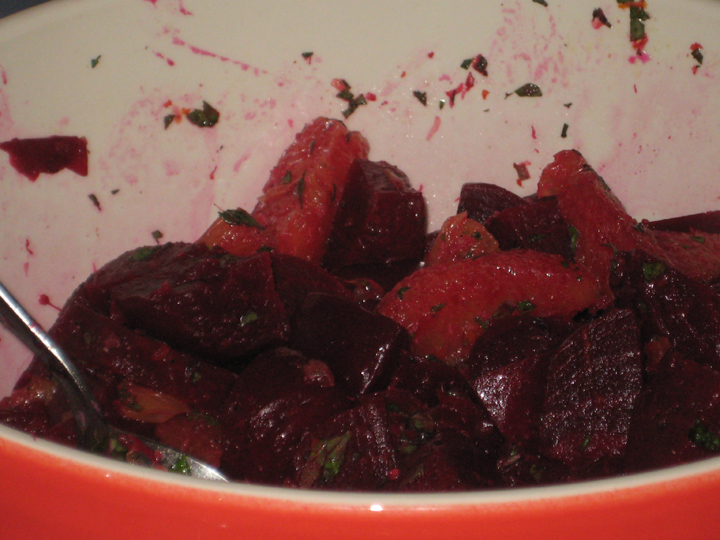 Roast for 30-35 minutes, turning once, or until potatoes are tender. 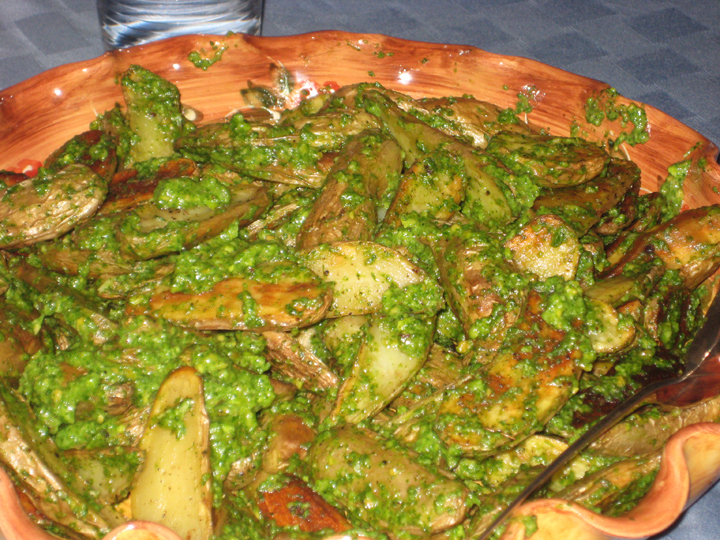 Toss hot potatoes with the pesto and serve.